The city of Houston has not had a full size amusement park since the surprise closure of Six Flags Astroworld at the end of 2005. Its place has been taken, at least in part, by two seaside boardwalks, one in Kemah, and one in Galveston. We'd hoped to arrive in the general area of the park by late afternoon, but things didn't quite work out that way thanks to a lengthy delay at Houston Intercontinental. The ground staff at the aforementioned facility ware apparently taken by surprise at the on-time arrival of the British Airways flight from London, leaving us on the taxiway for the better part of an hour, and once we were able to disembark there was a "longer than normal" wait (as usual) for immigration. It was approaching dinner time by the time we'd collected our rental car, so we decided to stop for food before heading to the park. One of the challenges of any seaside area is sensibly priced parking, especially on a sunny evening in the middle of a holiday weekend. As such, it was quite a pleasant surprise to find an on-street spot almost directly opposite the park entrance. It did take me a number of attempts to shoehorn our rental yank tank into the spot, thanks to a turning circle of a barge and a blind spot the size of Peru, but in the end I managed it. I'll never understand why all the vehicles in the land of the motor car are, in a word, crap. But I digress. As of this writing, the Pleasure Pier has both unlimited wristbands and general admission deals. The latter is not particularly good value for money, but it is a cheaper option provided one partakes of three rides or less. Under ideal circumstances we would have gone for the wristband, but a combination of fatigue and the prospect of a three hour drive to our hotel put paid to that, pun not intended. Iron Shark (#1905) is a custom designed Gerstlauer Eurofighter with an unusually narrow footprint that immediately makes it stand out to even the most jaded coaster enthusiast. Better yet, this ride differs from the rest of the family in that it uses a comfortable design of lap bar that feels secure without being restrictive in any way. The lack of an overhead restraint meant that the tight four inversion layout was negotiated without any head-banging, and the result worked very well despite the track length being a little on the short side. Having said that, those who find the ride too short can simply ride again; that's what we did! There are many amusement parks where it is entirely acceptable for a coaster enthusiast to do a hit and run, namely a quick ride on the credit(s) before heading elsewhere. 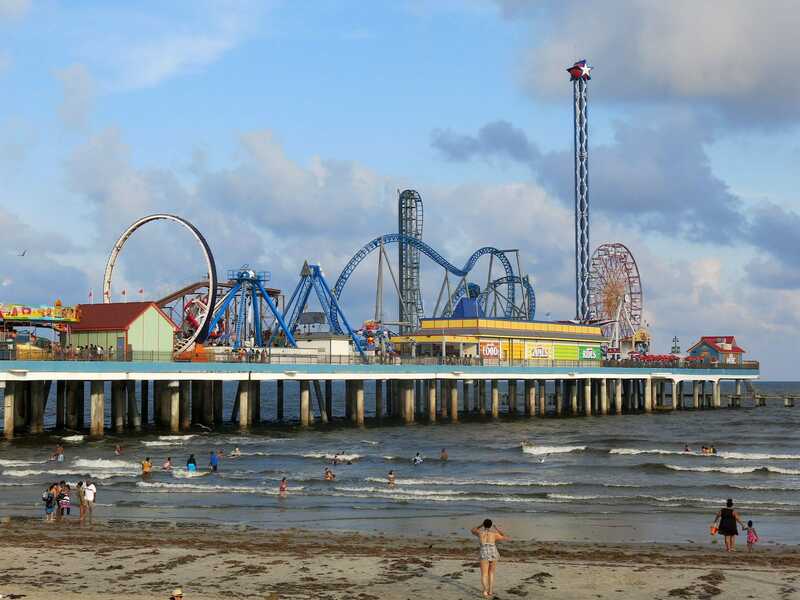 Galveston Pleasure Pier is definitely not in that category, and was deserving of far more time than we could afford to give it today. Hopefully we'll be back at some point in the future; it'd be good to enjoy it properly.